Add 1 glass water and green color to sugar and bring it to boil. Keep this aside, this is your sugar syrup. Add a cup of water to khova and cook. Keep stirring at the same time, see to it that it doesn’t stick to the base of vessel. Now add sugar syrup to this, boil it for 2 mins and keep it aside. Soak rice for 2 hrs and grind. Keep it aside. Boil milk and add grated gourd and leave on low flame for 30 mins so that gourd becomes tender. Then add rice paste to milk and cook for 5 mins. Now to the milk add khova sugar mix. Boil it for 5 mins. 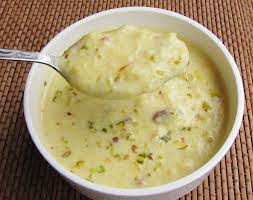 Kaddu ki kheer is ready. Garnish it with almonds and pistachio. Refrigerate it and serve cool. Yumm! Your recipes have made me home sick.... thank for sharing such delicious dishes.